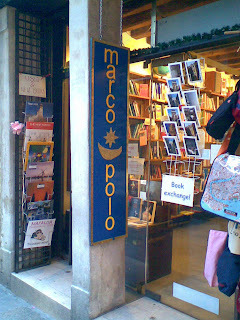 Libreria Marco Polo is the sister bookstore of the Libreria Internazionale Marco Polo in Venice and it is located near the famous Rialto bridge in Castello. Named after the great explorer and traveler, Marco Polo, it comes as no surprise that this bookstore specializes in none other than travel literature. Thus, it's by no means an understatement to say that this place is indeed a travelers' paradise. 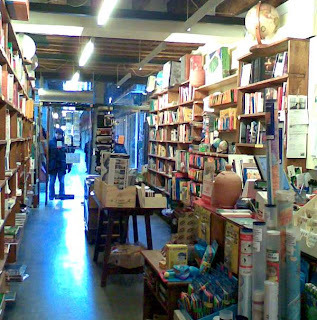 With walls covered in maps of various parts of the world, shelves filled with globes and books which celebrate cultures and diversity, anyone can enjoy the relaxed and cool atmosphere of this little store. Marco Polo's specialty are books on Venice, maps of the city, guides and books on its history. Furthermore, this place is great if you're looking for a book with typical Venetian recipes - yes, Marco Polo stocks a nice selection of cookbooks regarding the Venetian cuisine. There is even a small literature section near the entrance but for a reasonably better offer, head on to Libreria Internazionale. The staff in Marco Polo speak several languages and are always more than willing to give you a hand at finding the one travel book you need. Libreria Marco Polo is the first and only bookshop in the lovely city of Venice which specializes solely in travel literature: from maps (of cities, countries) to various guidebooks and travel books in many languages (mostly of course, Italian and English). The offer, consisting of both new and second hand books at reasonable prices, is more than satisfactory for anyone who desires travel related literature. Extra Information: Marco Polo offers 20% discount to the members of the Touring Club, 10% off to students and holders of the Cinema Card, 10% off on guides to the holders of the Prove card and 10% off on books on trekking and hiking to the members of Trekking Italia.